Interviews: Giant Panda Released to the Wild Friday is a big day for one of the most charismatic animals on Earth: the giant panda. Native to central China, the black-and-white bear was almost driven to extinction -- now one bred in captivity has been released back into the wild. Friday is a big day for one of the most charismatic animals on Earth: the giant panda. Native to central China, the black-and-white bear was almost driven to extinction before a conservation program began 40 years ago. The main thrust of that program was breeding the animals in captivity. On Friday, for the first time ever, Chinese researchers successfully released a panda born and raised in captivity back into the wild. After some prodding the adult male bear, named Xiang Xiang, lumbered up a hillside and into a stand of sheltering bamboo -- the giant panda's primary diet in the wild. He carries with him the hopes for the survival of the species. For the ongoing series of Radio Expeditions interviews on Day to Day, Zhang Hemin, the director of the Wolong Giant Panda Reserve Center in Sichuan Province, China, talks about the historic event. Alex Chadwick: Director Zhang, first of all congratulations on the release of Xiang Xiang . The panda is going to be released in this area, the very first one that's born in captivity and released into the wild. Is that right? AC: So how do you prepare a panda to be released into the wild? ZH: Three years ago we chose Xiang Xiang for training. After three years, his ability to go into the wild is very good. He [learned] how to avoid the natural predator and how to select the food habitat, and also the territory -- so it's very good. AC: The panda is a bear, and when you said he has to avoid a natural predator, what could possibly be threatening to a bear? ZH: The natural predator is [a] cloud leopard, golden cat, wild ox. AC: How are you going to monitor Xiang Xiang? ZH: We put a GPS collar [on the bear]. We have several researchers, telemetry every day on Xiang Xiang. AC: Are you going to follow him every day? ZH: Each month we will try to see him directly, see what he's doing, his condition. Other days, just check his position by telemetry. AC: Tell me about the process of releasing the panda. ZH: Today, we check the panda's health, put on the GPS collar, and tomorrow we will release [him] back to the field. And after that, we will let him go himself. And each day the researchers will use telemetry where Xiang Xiang is. And each month, we will send the researchers to look to find him, to see him, each month. AC: Has it always been your goal to release a panda back into the wild? ZH: Yes. Before, we rescued some wild pandas and let them recover and let them go outside. This is the first one from captivity-born pandas. If this succeeds, I will [be] training many of them, 10 or 20 each year. AC: So if this one succeeds, maybe you think you can save the entire giant panda species by breeding them in captivity and then releasing them into the wild? ZH: This is the best way to protect the genetic diversity of the wild pandas. Because you know, in China there are over six mountain systems [with] panda distribution.. Four of them have some small population, and also isolation distributed. AC: This must be the culmination of a really great dream for you, a very important day. ZH: That's right. I founded the captive panda breeding program -- now the survival rate is 100 percent in my reserve. The population in captivity increased a lot. So my final goal is not only captive breeding, but letting them go back to help the wild panda population. That's my final goal. AC: To help them go back to the wild, solving the captive breeding problem -- that was a big problem, that was very difficult to do to get them to survive. 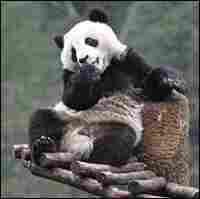 ZH: I spent 15 years to solve that problem of the captive panda breeding. Giant Panda Facts from the National Zoo in Washington, D.C.